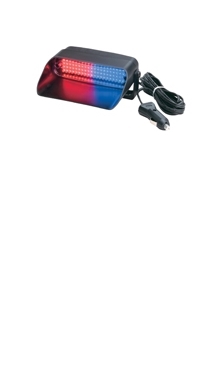 Can be used on headlights or backup lights. Override feature works with the vehicle's high/low beam switch to prevent high beams from flashing. 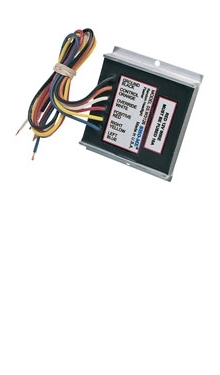 Can be operated from an existing low-current switch. Mounts on dash or rear deck. 80 high-intensity LEDs in one or two different colors. Solid-state internal flasher with seven strobe-style patterns. Housing-mounted on/off and mode touchpad switches. Flash pattern indicator LEDs on back of light. Scoop-style housing prevents windshield flashback. 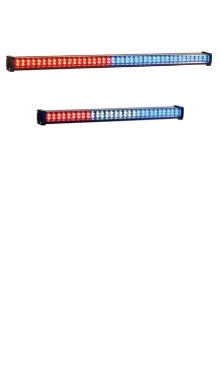 Available in solid or split LED arrays in amber, blue, green, red or white. 1 3/4" H x 5 7/8" W x 6 1/4" D (Without Bail) / 12 oz. Includes a windshield bracket, bail-mount bracket, Velcro disks for surface mounting, flashback shield and a fused cigarette lighter plug with 10’ straight cord. Variable-length light has four high-intensity LEDs per inch. New extruded aluminum housing has sliding bolt mounting channels (T-Slot) on back and bottom. New lens cover protects LEDs from dust and damage. AHF models include internal flasher with seven strobe-style flash patterns, adapter plug with on/off and momentary switches and “L” brackets. Available in 1-inch increments from 5 inches up to 5 feet. Available in single colors or combinations of amber, blue, green, red or white. Optional potting permits installation in wet locations. Sleek and stable, the aerodynamic LP6000TM lightbar from Code 3 delivers the light you need, meeting or exceeding industry warning standards. "Opticom" is a registered trademark of 3M Corp. The innovative patented dual-deck shape of the MX7000® gives you everything you want in a lightbar.